Jack Straw New Media Gallery, Seattle; co-presented with Jack Straw Productions as part of a year-long, multi-venue tribute organized by curator Beth Sellars. Archival Investigations offers a fascinating glimpse into the work of this renowned artist during the first five years after his arrival in Seattle at the dawning of the digital revolution. 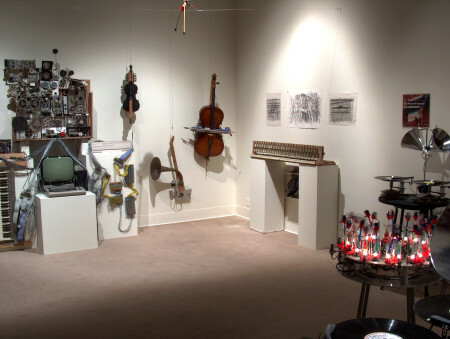 Surveying these early contraptions, assemblages, and artifacts – playful jumbles of cannibalized analog circuitry, toys, household objects, and motors – this gallery exhibit reveals that Trimpin was already thinking digitally, making brilliant (mis)use of the materials available to him before personal computers and MIDI technology were commonplace. We also see the humor, ingenuity, and craftsmanship that have become signatures of his large-scale installations.